You may not have told a lie, but if your pants are on fire, it's still not a good thing. Avoid the "no mas pantalones" effect by shopping our Flame-Resistant Pants. 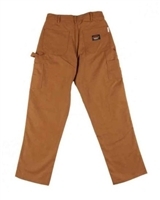 Our selection of FR Pants offer a way to stay safe on hazardous work sites. Made with cotton our Flame-Resistant Pants by brands such as Carhartt, Rasco, Topps, Riggs, Wrangler and Bulwark are as comfortable as they are safe. The pants also feature easy-care fabrics as well as pockets to stash your stuff. Flame-resistant hardware provides a sturdy finish while roomy designs offer plenty of room for you to move freely. If safety is your number one priority then gear up the right way with our Flame-Resistant Pants.